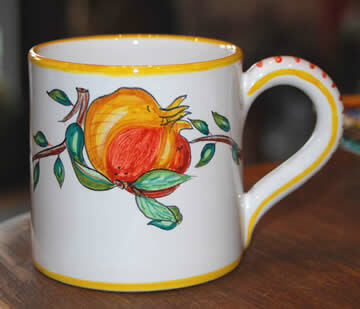 3.5 in x 3.5 in, 8 ounce capacity mug for coffee or tea in the fabulous hand painted fruit and nature design. 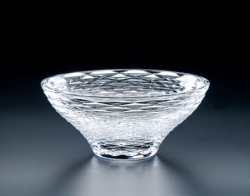 Irish born designer, Carol Brannigan, has been living in Italy since 1993. A graduate of the University of Ulster at Belfast, Carol has been collaborating with the Grazia factory since 1997. Carol has a particular eye for detail and renders each piece of work unique through the dedication she puts into every brush stroke. The ability to read into the fundamental elements of reality and re interpret them through the light of her own creativity. This is the extraordinary artistic ability that has determined their success of Carol Brannigan. Her designs extol the colors and the shapes of nature, and her personal interpretation render them as harmonious on the majolica as in nature itself. in this design she has been inspired by the warm tones of the pomegranate, which is also the symbol of fertility and prosperity.